In TV Ad, GOP Senate Candidate Mocks 'War On Women' Rhetoric : It's All Politics Terri Lynn Land, a Republican running for Senate in Michigan, says she knows more about being a woman than the male Democratic congressman who's attacking her. 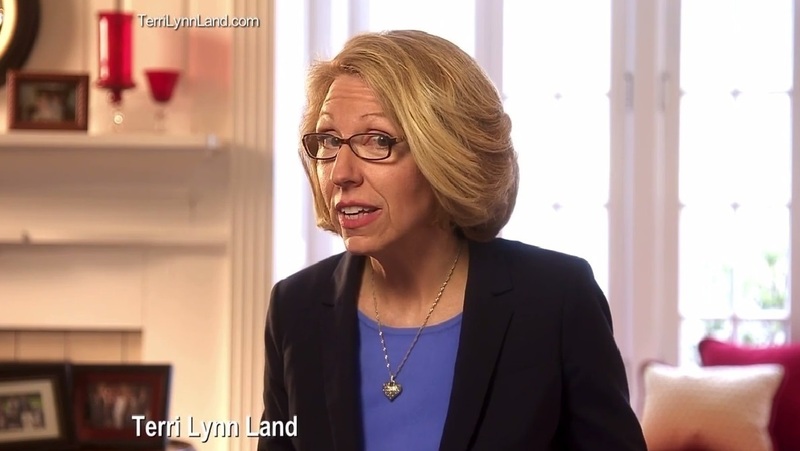 A scene from Michigan GOP Senate candidate Terri Lynn Land's first TV ad, titled, "Really?" For her campaign's first TV ad, Michigan Republican Senate hopeful Terri Lynn Land is taking an unconventional approach. She's attempting to take a familiar Democratic attack line and flip it against her male challenger. The ad, titled "Really?" mocks the suggestion that Land, Michigan's former secretary of state, is "waging war on women." "I'm Terri Lynn Land. Congressman Gary Peters and his buddies want you to believe that I'm waging war on women. Really? Think about that for a moment," she says. For the next 12 seconds of the ad, Land stops speaking and a campy musical interlude plays. Land stares briefly into the camera, reaches for and takes a sip from a blue mug, looks back at the camera and shakes her head in disbelief and then looks at her watch. The idea is to humanize Land; she's been under fire from Democrats recently for remarks she made in 2010 that women are "more interested in flexibility in a job than pay." Even President Obama has gotten into the act, calling out Land — though not by name — as being cut from the same cloth as the Senate Republicans who voted against a bill aimed at closing the pay gap between men and women. "Now, apparently, a lot of these Republicans during the debate said they just think that this idea there's a gender pay gap is a fantasy, it's not real, there are all these other reasons why this happens," Obama said at a Houston fundraiser earlier this month. "And in fact, I think there was a candidate for the Senate, a Republican in Michigan, who voiced the opinion that women make other choices. And I think that's certainly true; every individual makes other choices. Very rarely do you meet people who make the choice to be paid less for doing the same job." Land's campaign is betting viewers will find it implausible that a seemingly down-to-earth woman is waging a war on other women. The 30-second spot, which according to the Land campaign is airing in several markets across Michigan, concludes with the Republican saying, "I approve this message because, as a woman, I might know a little bit more about women than [Rep.] Gary Peters." The congressman's campaign accused Land of playing political games. "Given Land's track record of opposing equal pay for women, and supporting a plan that would ban common forms of birth control like the pill and cut access to preventative care like mammograms, Michigan women deserve more than a 30-second gimmick," an aide to Peters said in a statement. Land and Peters, who represents a suburban Detroit-based district, are the likely nominees in a hotly contested race to replace long-serving Democratic Sen. Carl Levin. A six-term incumbent, Levin is retiring when his term expires at the end of the year.